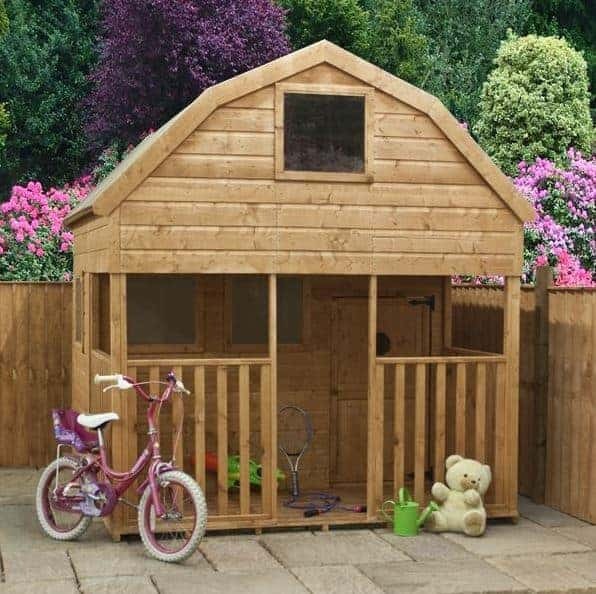 The impressive, 7 x 7 Waltons Dutch Barn Veranda Outdoor Playhouse is something that just oozes charm and is sure to provide the kids with hours of fun and years of fond memories. The playhouse has passed numerous child safety tests so it is every bit as safe as it is fun. Despite not taking up a whole lot of real estate in the garden, the playhouse still has lots and lots of room for the kids to play. Inside there is actually a second level and on the outside there is that lovely veranda and decking area where they can sit on a warm summer day. 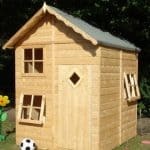 One of the most incredible things about this playhouse is just how well it has been made all the while keeping the price very reasonable. Tongue and groove shiplap cladding makes up the walls and that is aided with one very impressively strong frame that makes this a very secure place for the kids to play. The floor on the ground and upper level is made with solid sheet boarding and is able to take the weight of a few kids and a whole load of toys. That amazing looking apex roof with its dome style is going to keep the water out as well as being a stand out feature of the playhouse. You may get jealous you are too big to fit inside! We feel that it is impossible for kids not to fall in love with the 7 x 7 Waltons Dutch Barn Veranda Outdoor Playhouse the moment they see it. We are also sure more than a few of you adults will wish that you could shrink down and play in there too. 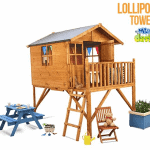 This is one of the most charming and gorgeous looking playhouses from Waltons. With 6 feet 11 inches of depth and 7 feet 3 inches of width there is a lot of floor space for the kids to make use of inside the playhouse. 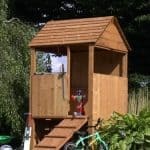 The overall height of the playhouse is, 7 feet 9 inches the reason it is so high is because this is a dual level structure so the kids have a fun little ladder that will take them up to a second level where they can store all kinds of stuff or even have a little sneaky afternoon nap. One of the standout features of this is the veranda this gives the children another little area where they can either sit down and relax or perhaps even put some more toys, a table and anything else they may want here. We absolutely love this veranda, decking and the little fence that supports it. The apex roof is very eye catching thanks to it having a very unique look. While this is an apex roof it is designed so that it has kind of a dome style look to it. The roof is made with solid sheet board and then covered with some very high quality sand felt that finishes it off very nicely. This has a very smooth and high quality look to it and that is because of the fantastic, 12 mm thick tongue and groove shiplap cladding which Waltons have used. This cladding is very well designed, so well that there is now way water can get in through it. We really do love how they have managed to make this cladding have such an attractive look, but at the same time ensure it will keep out the water. Like the rest of the wood the framing has been smoothed and has had the edges rounded for added safety. But as the frame is an impressive, 27 mm x 45 mm in its size it also makes sure the playhouse is one very robust structure. Kids can play a little bit rough and this is going to be able to take it thanks to the impressive frame. The kids are going to be able to run around, dance, wrestle and do whatever else their crazy imaginations come up with in here as the floor is so strong. It is made with 10 mm, thick solid sheet boarding and we are very happy with this. The upper level of the playhouse has a floor that is also just as strong. 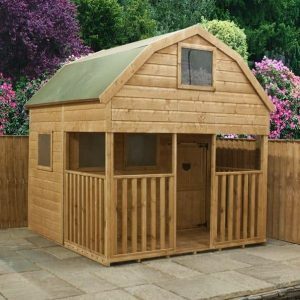 The 7 x 7 Waltons Dutch Barn Veranda Outdoor Playhouse does require a coating of wood treatment to keep that wood rot free, but as of writing they are actually giving you a free 5 litre tub of golden brown wood treatment. The first coating should be applied shortly after construction and then a fresh coat once a year should be applied. As is the case with all Waltons sheds and playhouses, you get a 10 year anti rot guarantee with this playhouse, but to make it valid the playhouse must be treated. The people who designed this playhouse clearly know that kids fingers are a magnet to getting stuck in doors. We say this because they have made sure that the door is kid friendly by having a small gap round the edge so there is never any tears from trapped fingers. As kids seem to be incapable of closing a door softly, Waltons have made sure to use very strong hinges to keep the door in place. The door is a good size so them dragging all their toys inside is not going to be difficult. Also there is a very cute, circle window on the door so when someone knocks, they can peek out and decide if they want to answer. There are six good sized windows on the playhouse, well actually seven if you count the little one that is on the door. Two are on the front, one on each side and then there is one on the upper level as well. These windows are made with strong styrene which is great as it keeps the costs down and most importantly of all will not result is glass being all over the place when play time gets a little bit out of hand. As is the case with most playhouses there is no lock on the door. This is a good thing as the last thing you want to deal with is having to unlock it every five minutes. 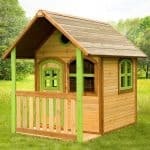 The overall structure is very secure and the door does shut fairly securely so you can keep it well closed when then kids are not playing in it. This is not what we would call a private structure. To start with there are seven windows and the look of it is just so lovely that you cannot help, but want to look at it. If the kids do get sick of mum and dad looking at them while they are playing then let them pick out some curtains or some fabric to put on a couple of the windows. There is not much in the way of customisation options with this playhouse, but we are sure there is a lot of fun to be had by deciding what kind of things go on the outside such as a chair, table or even their bike like in the picture. So while there is not anything you can do about the actual structure itself, the kids can have the time of their lives designing the inside and the outside. 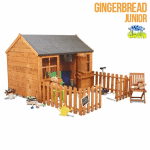 One of the most interesting extras that is available is a cabin wooden kitchen for, £49.99. This would be a fun extra to add as they can pretend they are making their friends or even their teddies dinner. If you are not too sure about the surface you are building this on, then they do have a portabase at a cost of £89.95. You can upgrade the roofing felt to a superior duty felt for a cost of, £34.95 this is available in olive green and charcoal. 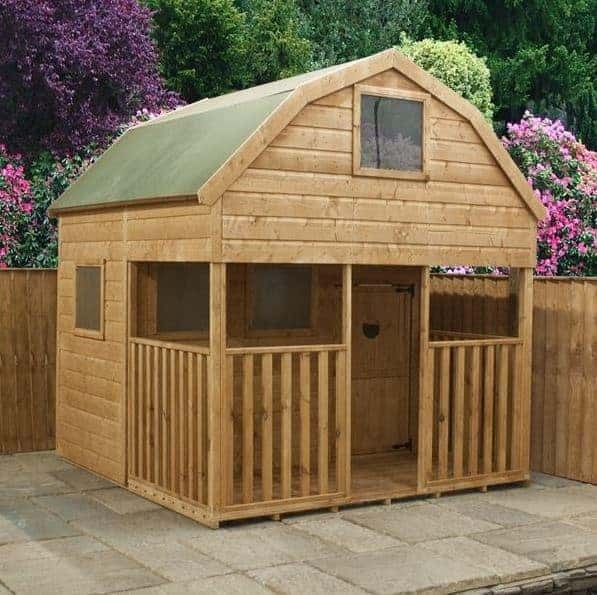 The last extra is an installation service, where for a rather pricy, £289.99 they will install the shed for you. Waltons have made sure that is a high quality and kid safe structure so we are very impressed with the overall quality. These types of materials are designed for rough play so the playhouse is easily going to last as long as the kids are able to fit inside it. The amount of space for play time in this playhouse is just incredible. There is actually three different areas with the ground floor, upper level and the decking outside. You will need another person to help you build this, but following the diagrams and instructions should see you have this built in around 3-5 hours. You can add about an extra 7 hours on to this if the kids are helping. There is going to be a lot of laughs coming from this playhouse and you really cannot put a price on that. But we must say, Waltons have really managed to do an amazing job at making this such a reasonable price, despite the high quality materials used. Final Thoughts: We really love the whole look of the, 7 x 7 Waltons Dutch Barn Veranda Outdoor Playhouse. It is one of the most aesthetically pleasing playhouses we have seen in quite some time. It serves as a great way to get the kids outdoor, off their Xbox and make them use their imagination to play. Many years of fun are going to be had inside of here and thanks to the impressive materials used in its construction it is going to last a very long time. 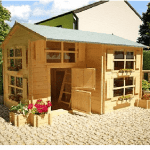 True there are cheaper playhouses on the market, but we feel that the style and the fact there are three different areas for play here make this well worth the money.